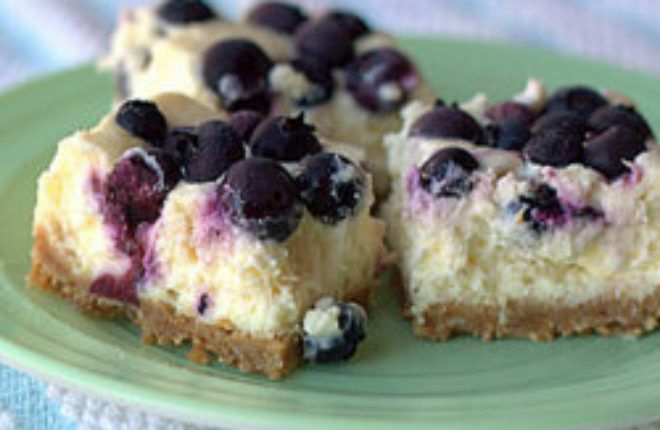 Tangy lemon-tinged cheesecake liberally dotted with fresh-picked blueberries, atop a buttery graham cracker crust... it's like summer in a square. The bittersweet truth is, fall is pretty much here – and I, for one, am feeling it. In fact, I’ve just about given in. I’ve been thinking about pumpkin recipes. I lit an apple candle. I even found myself brewing up some chili in the crock pot a couple days ago. But in one last-ditch attempt to hold on to the sunny joy of our too-short Seattle summer, I took my two youngest nephews to the blueberry farm and we gathered the last few berries from the last few bushes that had still had them. 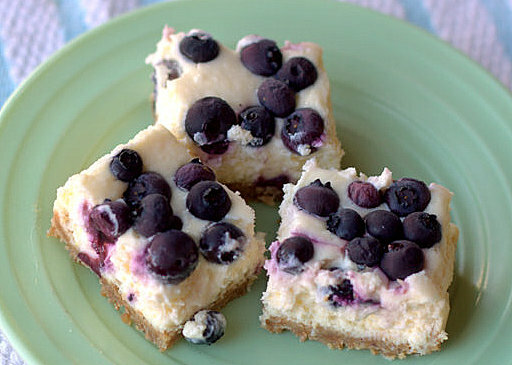 And then I made these Blueberry Lemon Cheesecake Squares. Perfect for a potluck or just to keep at home for yourself, these bad boys are a slight adaptation of Tyler Florence’s delicious recipe. 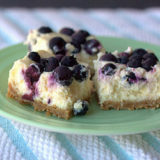 Tangy lemon-tinged cheesecake liberally dotted with fresh-picked blueberries, atop a buttery graham cracker crust… it’s like summer in a square, and, I think, the perfect way to bid adieu to the season. If you’re ready, of course. Otherwise, multiple pans may be in order until the time is just right. Butter an 8-inch x 8-inch baking pan, then press a square of parchment paper into the pan. This will help you lift out the finished product. Bake the crust for about 12 minutes, or until it begins to turn golden brown. Let cool completely. Mix the filling: Use a stand or hand mixer with a whisk attachment (if you have one), and beat together the cream cheese, eggs, lemon zest, lemon juice, and sugar until smooth. You can also do this in a blender or food processor to help ensure a smooth consistency. I simply used my Kitchenaid stand mixer and the whisk attachment. Pour and sprinkle: Pour the filling over the cooled graham cracker crust. Spread evenly with a knife or spatula. And now sprinkle the blueberries evenly over the top. Pretty! Bake, cool, cut, and serve: Bake at 325 degrees for about 40 minutes, or until the middle just barely jiggles. I recommend you start checking the bars at about 35 minutes, though - ovens vary! Allow to cool completely at room temperature, then refrigerate for at least 3 hours. Remove from fridge, and using the parchment paper as little "handles," remove the bars from the pan. Cut into squares with a sharp knife. Serve. Okay – yum. Totally could eat one of these right now. Or perhaps three. I hate that I didn’t get to meet you over the weekend. Maybe our paths will cross again sometime! I need a new cheesecake recipe and think I will give this a try. Mmm, these look fantastic!!! I need to make these, then try not to eat them all!! These look divine, and seem to be the perfect blend of sweet and slightly tart!